In the last 15 years, research in swarm intelligence has generated a substantial amount of knowledge on the modeling and control of swarms of interacting agents. This has happened across a number of different disciplines (theoretical biology, operations research, and robotics are just a few examples) mainly following an experimental approach. The results generated by these research activities are highly promising and provide clear avenues of exploration for future research. The E-SWARM project will contribute to the development of the scientific foundations of swarm intelligence systems. Such foundations will allow a better understanding of the way swarm intelligence systems function. They will also allow the principled development of engineering tools that will allow the design and construction of well-working artificial swarm intelligence systems. In this way, artificial swarm intelligence systems will become a well-understood tool in the hands of scientists and engineers. The E-SWARM project will therefore have a fundamental impact on the field of swarm intelligence. Additionally, we expect the project to have a strong impact also on the research domains that we have chosen for our case studies via the development of innovative solutions to the different problems that will be studied. The core of the project is constituted by the Foundations & Methodology workpackage. In this workpackage, we will deepen the theoretical understanding of artificial swarm intelligence systems, propose general principles that are applicable to their design in different domains, create an engineering methodology for the discipline of swarm intelligence, and propose a structured approach to the construction of swarm intelligence systems. The goal of this workpackage is to identify general, theoretically motivated principles for the design of swarm intelligence systems. These general principles will be applicable to the design of swarm intelligence systems in different domains. We will do this by identifying which of the dynamics investigated in the case studies are fundamental. We aim to combine our theoretical analyses of these fundamental dynamics into a general framework or theory of artificial swarm intelligence. Currently, the two main E-SWARM case studies are Swarm Robotics and Swarm Optimization. Empirical methods, computer simulations as well as experiments with real robots, are being used to validate the theoretical results and to study how the principles under investigation can be applied to the development of a wide range of swarm intelligence systems. 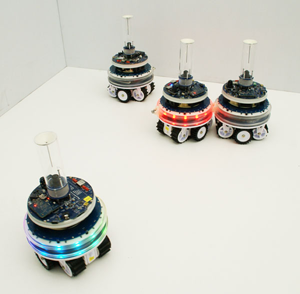 We study the use of swarm intelligence as a tool to develop controllers for swarms of cooperating robots. The principles of swarm intelligence are employed in swarm robotics for the design of robot controllers at the individual level so as to obtain effective swarm-level behavioral strategies. We focus on swarm behaviors characterized by the coordination and cooperation of the members of a group of robots to accomplish tasks that are beyond the capabilities of a single robot. Swarm robotics is inspired by the observation of social insects (e.g., ants, termites, wasps and bees) which stand as fascinating examples of how collectively intelligent systems can be generated from a large number of simple individuals. As in their natural counterpart, the robots used in swarm robotics are relatively simple, with local and limited sensing and communication abilities. It is a natural consequence of these individual characteristics that the overall systems are robust against failures of individuals and scalable with group size. We work within a scenario in which robots are given tasks whose solution requires strict cooperation. We study how a swarm robotics system can adapt to different tasks, varying environmental conditions, varying numbers and types of robots, and to different levels of malfunctioning of the robots. We study the use of swarm intelligence approaches for optimization. In particular, the goal is to significantly broaden the range of applications of swarm intelligence to include the solution of rich optimization problems, that is, problems that are multi-objective, dynamic, and stochastic. Computationally difficult optimization problems frequently appear in many important fields. 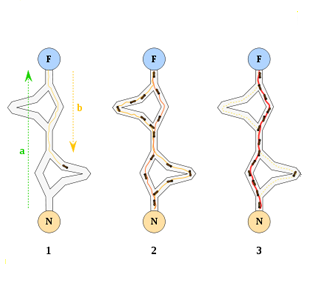 A few examples with high impact are the creation of good schedules and timetables, the design of efficient networks, and the solution of various problems that arise in bioinformatics. Generating high-quality or optimal solutions to these problems can result in enormous economic savings, in a more efficient usage of scarce resources, or in new scientific insights. Most academic research on algorithmic solutions to optimization problems has focused on problems that are strong simplifications of those practically occurring in the real world. This makes the results obtained by academic researchers often difficult to apply to problems that, as is the case in the real-world, present features such as multiple objectives (that is, solutions are evaluated according to several, often conflicting criteria), and dynamic modifications of the data (that is, the objective function or the constraints may change while implementing a solution). Similar difficulties apply to problems where the objective function or the constraints are stochastic in nature. We call problems that have at least one of these features rich optimization problems. We believe that swarm intelligence approaches are particularly well suited for the solution of rich optimization problems, because they already demonstrated a very high performance on the academic simplified instances, and also because they are inherently robust, distributed, flexible and stochastic.